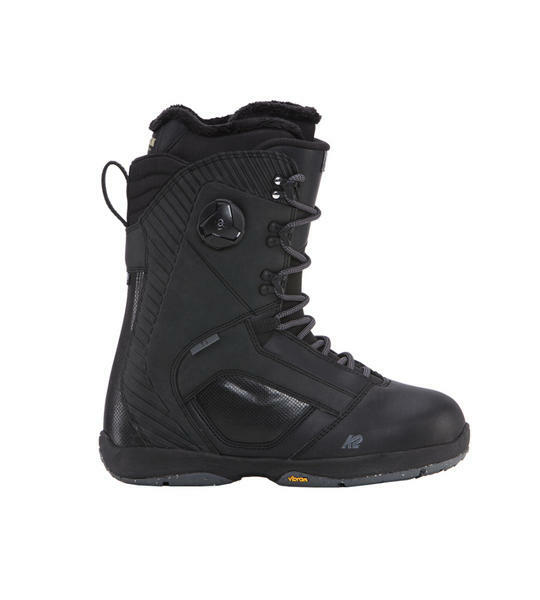 The K2 T1 is K2's down-to-business all mountain snowboarding boot. Focused on stiffer support, K2 pros like Lucas DeBari depend on the T1 for their most critical lines and long days through changing terrain. Packed with proven technologies like a Vibram outsole for extreme durability and improved grip on Ice and Snow, Intuition liners for a full heat moldable custom fit and Boa Conda liner system to dial in your heel hold. The T1 is your ticket if you are an all mountain charger! The Endo construction in this boot makes the flex stiffer as this is a urethane insert which sits up the spine and along the side of the boots. This adds to the longevity of the board too making sure this is a minimum 100 day riding boot. To help with this K2 also us a wrap toe cap meaning no seams again for longevity. If you want to ride fast, ride steeps, you want response then the T1 is for you.